If your home is like ours, there are little ones who love to play with dolls and mother them. It’s so precious watching our wee ones nurturing their “babies” and these gifts from Corolle will really hit the mark! 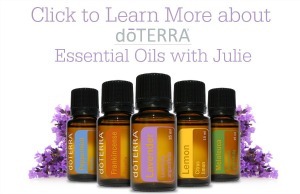 We are proud to include Corolle in our Holiday Gift Guide. Corolle began over 30 years ago in France’s Loire Valley. Each Corolle doll is designed with great care, love and affection because we know that a doll is more than a toy; it is a cherished part of a child’s growing up: A doll encourages a child to explore different roles through caring for and sharing hopes, dreams and experiences with an always-understanding friend and playmate. Calin Grenadine is the ideal first baby doll for the littlest mommies ages 18 months and up. This adorable 12-inch baby doll is just the right size to cradle in a young child’s arms. She has a cuddly soft beanbag body, so she can be posed like a real baby, and supple vinyl skin that is delicately scented with vanilla — a Corolle signature. This cuddly, lightweight 12-inch baby doll is designed to be loved and cared for by little mommies. Calin Grenadine’s sweet face will charm and captivate children ages 18 months and up, and her soft beanbag body can be posed like a real baby. Calin Grenadine’s smooth, supple vinyl skin is delicately scented with vanilla — a Corolle signature, and her blue eyes close when Calin is put down for a nap or at bedtime, also like a real baby. 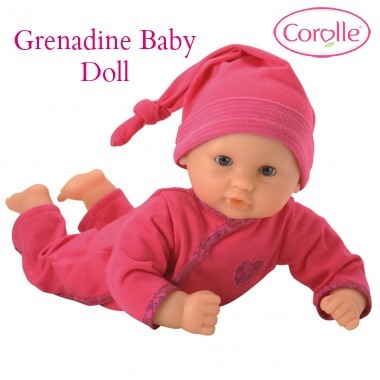 You’ll be delighted by the loving, nurturing attention your little one gives her Calin Grenadine Baby Doll. Make-believe mommies 3 years and up will love taking their favorite baby doll for a stroll in Corolle’s Mon Classique Carriage! With styling inspired by those for real babies, this gorgeous carriage has an adjustable hood, a storage basket, and even a removable carry bed so it’s really two accessories in one! Corolle’s Mon Classique Carriage is a wonderful accessory for your little one and their favorite baby doll. Smartly styled and sturdily constructed, the carriage also has an adjustable hood and a storage basket to keep baby dolls’ accessories within easy reach. Plus, the carriage features a lift-out carry bed — with padded, easy-to-grasp-handles– so it’s really two accessories in one. Corolle’s Mon Classique Carriage fits up to a 17-inch baby doll (sold separately) and can be collapsed when playtime is over for easy and convenient storage. It’s bedtime for a favorite doll in Corolle’s Mon Classique Cradle, the perfect size for any baby doll up to 17 inches tall (sold separately). Designed in France and part of Corolle’s Mon Classiques Collection for little mommies ages 3 years and up, this pretty cradle includes a white pillow and blanket, both embroidered with a pink heart. 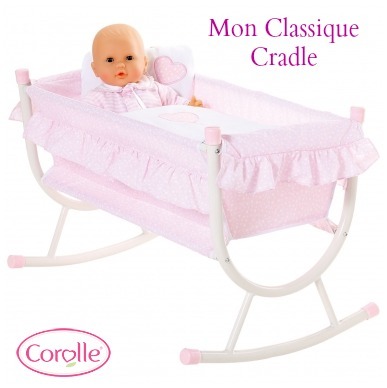 Corolle Mon Classique Cradle makes a perfect addition to any baby doll’s nursery. This gorgeous cradle constructed from high quality, durable metal and fabric will allow your make-believe mommy to gently rock her favorite baby doll to sleep each night in style. A pretty pink fabric liner printed with small white pebbles and edged in ruffles covers the frame. Plus, the Mon Classique Cradle comes complete with a coordinating pillow and blanket to keep baby doll comfortable and warm while sleeping. The Mon Classique Cradle fits baby dolls up to 17 inches tall (sold separately). That cradle is exactly what I’m looking for for my daughter!